It’s crazy to think John Ryland from Classified Moto only bought his first bike seven years ago. Since then he has definitely made up for the late start. By the end of that first year of riding, John had already owned three bikes. 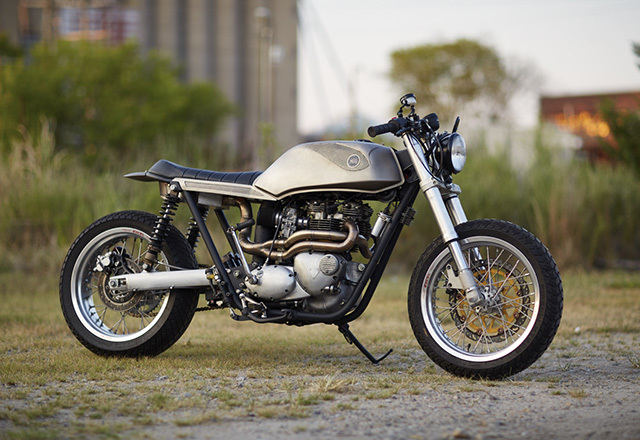 This 1979 Triumph Bonneville T140 was the third bike he had ever owned. It holds significant importance to him because he traded a mint ’81 Kawasaki KZ550 for it – unfortunately the Bonnie was a complete basket case. “It was my daily driver when I was working on my very first front end swap on a 1980 Yamaha XS850” he recalls. One day John decided to ride down to Penny Lane Pub to watch the USA in a World Cup qualifier. “I’ll ride my British bike to the pub to watch some football” he thought. He kick started the bike and the exhaust fell right off at the head. So he decided to park it and decided to catch a cab. 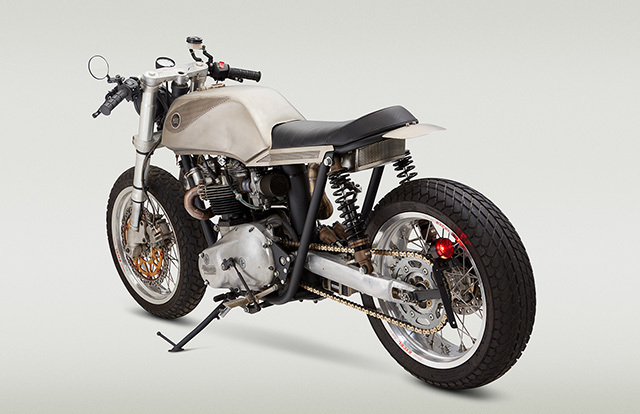 Obviously the whole ‘Frankenstein’ look is a big part of the Classified Moto look. This one takes that to the next level. It’s an old Triumph with a Kawasaki KLR650 swing arm modified to accept dual Progressive 970 shocks and Excel Supermoto wheels that are actually made for a Honda XR650L. 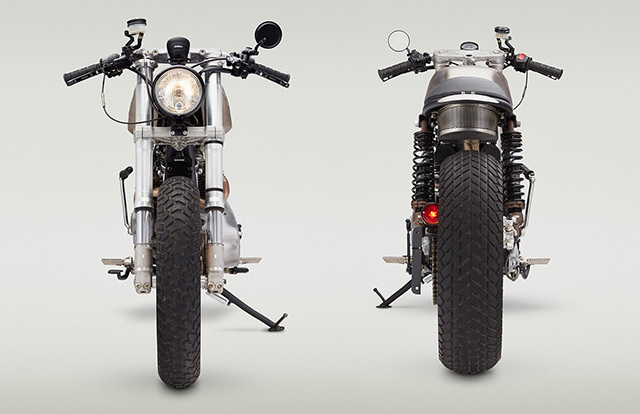 The distinctive angular tank is from a Honda CB450T Hawk and the front end is from a Ducati Monster 600 – also fitted with an Excel Supermoto wheel from an XR. 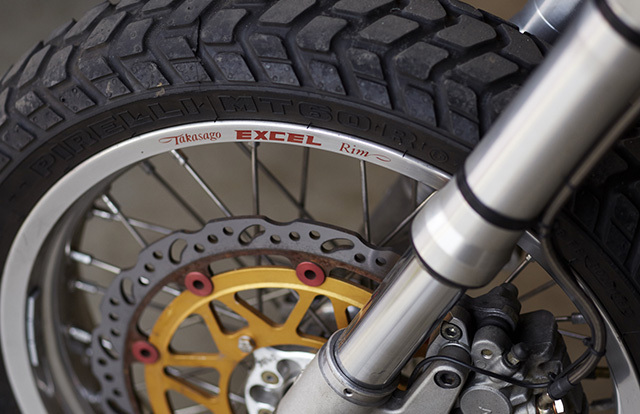 As for tires, the rear is fitted with a Avon Supermoto and the front is a Pirelli MT60. 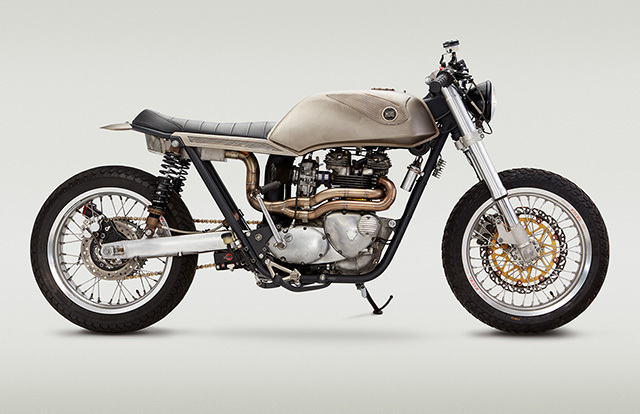 Fittingly, the Bonnie’s weak link in its former life – the exhaust – is now its strength. “Or at least we went way out of our way to make it that way” says John. 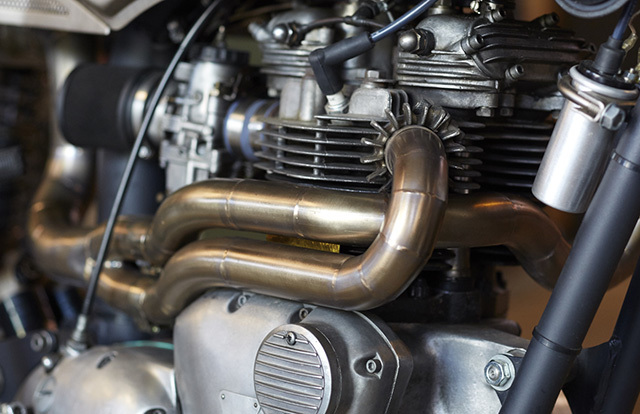 The stainless steel pipes snake around the bike in very elegant way – tucked nice and close to the motor. 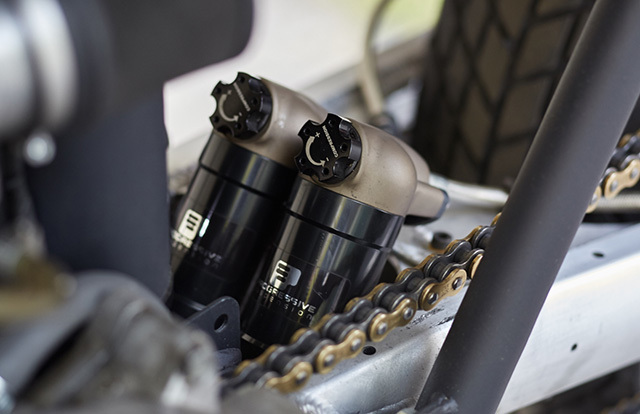 To compensate for this, the CM team added a heat shield between the pipes and the cylinder. The pipes are a work of art in themselves. 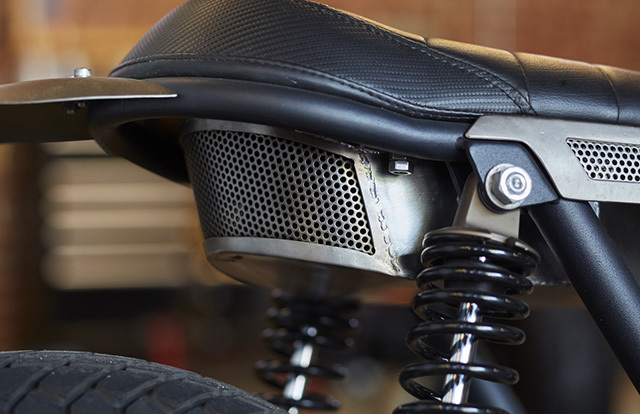 They collect into an up-pipe that enters the under seat muffler that directs exhaust fumes through twin pipes and a layer of stainless mesh. Don’t worry, there’s also a heat shield under the seat. 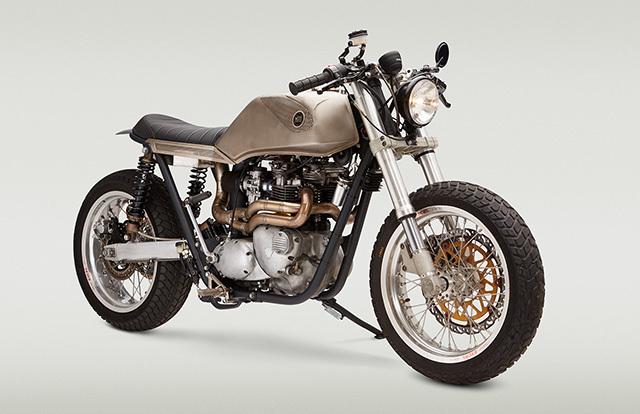 After building around 50 bikes in the last seven years, John thinks this Triumph takes the ‘most fun to ride’ award. “The bike is a joy to ride, and for whatever reason, is the smoothest, most factory feeling bike we’ve produced to date – despite the grab bag of components.” Maybe not one for the Triumph purists, but you gotta love Classified Moto’s ingenuity.